We have been indulging in alot of cakes over this year and recently, we went for some cakes again at Patisserie Glace at the Icon and Obolo in Joo Chiat. Patisserie Glace cakes while having bigger slices follows the Japanese style cakes with light fluffy, soft sponge and cream such that you don't feel overwhelmed despite the bigger serving. Obolo features heavier tasting cakes in a smaller slice. Our personal opinion was that Obolo is still the standard to beat in terms of taste and aesthetics, presentation which proves that the best things in life do come in smaller packages. Obolo cakes features many intricate ingredients fused that add to the rich and multi faceted experience that you get when you taste the different layers of each cake slice. Every slice of cake at Obolo is a fusion of different layers that are distinct in flavor, yet complement to make the cake slice as a complete tentalising experience. (Above) Fruits Crepe featuring fresh juicy sweet strawberry set in Chef Yamashita's Baravian cream layered with crepe, a unique connoction. (Above) Double Cheese Rare Mango comprising of mango cubes, puree and melt in your mouth cheese. (Above and Below) Nikita Cheesecake from Obolo - Dark chocolate ganache mousse layered with refreshing dark cherry and raspberry compote jelly and smooth pistachio ivoire mousse paired with layers of almond and chocolate biscuit bathed in cherry and kirsch syrup in between. (Above) Macarons - Ruby featuring raspberry infusion coupled with dark chocolate ganache and Salted Caramel Chocolate with salted butter and caramel ganache. (Above and below) Yuzu - a refreshing treat featuring lemon mascarpone mousse, japanese yuzu- citrus cremeux with moist vanilla genoise and mango passion gelee on a base of ivoire crunchy feuillitine. (Above and Below) Verrine Caprice - apricot mango gelee layered by hazelnt milk chocoloate crunch, moist choclate genoise topped with a mini bittersweet chocolate macaron. This weekend, we went to have ramen at the Yoshimaru Ramen Bar at Playground @ Big Splash. 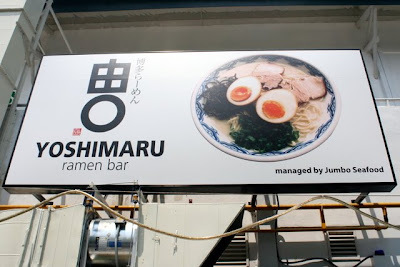 Yoshimaru Ramen Bar is an established ramen bar in japan brough to Singapore by the Jumbo Seafood people. It serves Hakata ramen that originated from Hakata, Kyushu. The most distinctive difference about Hakata ramen from others is that the noodles are much thinner and firmer in texture but which adds up to a very fuifilling meal. While the menu is limited in it's offerings, the prices are reasonable and the ramen offering reasonably good. The soup base(above) has a rich stock being boiled with collagen extracted from pork bones but yet has a mellowed flavour so the array of condiments on each table is there for a purpose for each one to individually spice up their soup.Personally, me and Gayle felt that health conscious people may like it as it was not salty but for us, condiments are needed to give the soup some kick and salt. A novel way to keep the diners occupied is to provide each with a bowl of sesame seeds and a pounder so that diners can throw in some condiments and mix and pound it with the sesame seeds and then throw it into the soup when the ramen arrives. Yoshimaru Ramen Bar's design provides for a chic and cool place to slurp japanese noodles in comfort although we felt that the music video being played was a little too loud as a background music. As this was our second visit there, we could use the discount coupons given on our first trip which entitles you to $10 off every $25 spent which is quite worth it. I ordered the Shabu Shabu beef ramen while Gayle ordered the traditional Hakata ramen. My shabu shabu beef ramen(above) had strips of soft and really juicy and tender beef slices which helped to add to the sweetness of the soup. The ni tamago- seasoned egg(above) was so soft, tender with the yolk literally melting in the mouth. Gayle's Hakata ramen(below) has thin tender and juicy slices of pork slices. There are side dishes available but personally, we felt that the richness and good texture of the ramen and soup made for a substantial meal.2 Full bowls of ramen cost us $29 with GST but we paid only $19 after the $10 discount. It is worth a visit there or two if you want to have a reasonably good bowl of Hakata ramen. For our 2nd Wedding Anniversary, we went for a short hotel stay over the weekend to have a relaxed time together. We started off with a relaxing customised spa session at The Retreat Spa at Changi Village Hotel. After the relaxing massages and body wrap, we proceeded on to Marina Mandarin Hotel where we had booked a 2 nights stay at the Executive Premier Room with Balcony for $479 inclusive of taxes. This package is available to all VISA cardholders. It was a really relaxing time with nothing but just lazing around in the room, watching cable, makaning , shopping at Marina Shopping Centre and Suntec, and just having quiet moments together. (Above)Admiring the lobby view from our 19th floor room. (Above)Left view from our room balcony. (Above)The Bedroom looks cozy and contemporary. (Above) Study section of the room. 42 inch LCD TV provides good entertainment. (Above) Marbled tiled Bathroom and Hansgrohe fittings lend an air of luxury. Our previous bar stool which I had bought for Gayle to use as an interim seat for her electric piano was spoilt as the height adjustment mechanism had broken down. So on one of trips to Viviocty's Gain city electronic store, we spotted a modern steel piano seat which was what we were looking for as most of the others we had seen were the traditional wooden based seat type. Costing $120, this QuikLok Performance Structure built seat that I bought for Gayle is constructed with 30x30 stainless steel tubing and welded joints for strength and durability. There is also a steel plate reinforcement that provides stable undersupport to the cushion seat. We like this seat because it is not only sturdy and modern in design but also provides for comfortable seating with a 8 cm thick cushioned seat with textured vinyl seatcover. This also allows for easy cleaning. The seat's height can be adjusted between a range of 46.5cm to 64cm with a secured locking pin. All these at a lightweight 5.5kg enables ease of carrying the seat which can be dismantled flat for removal. (Above) The rubber ends of the legs provide a secure, non scratch grip on the flooring.